Learning organic chemistry is like learning a new language. With a new language comes a new way of speaking and a new way of writing. In organic chemistry we communicate with lines and letters. Drawn to represent a bond coming out of the plane of the computer screen or paper. In essence this bond is pointing toward you. Drawn to represent a bond going into the plane of the computer screen or paper. In essence this bond is pointing away from you. 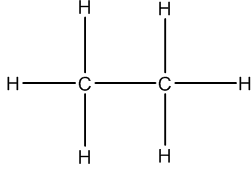 Anytime there is a line drawn, the atom at each end is a carbon unless otherwise indicated. Looking at this Line-Angle Formula drawing we see a line. Each end of the line has a carbon. 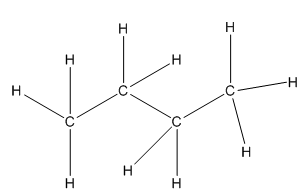 Since the carbons are connected by a single bond, each carbon has three hydrogens attached to it. Well, there are three lines, right? Each positioned at an angle to one another to indicate that there is a new carbon at that joint.